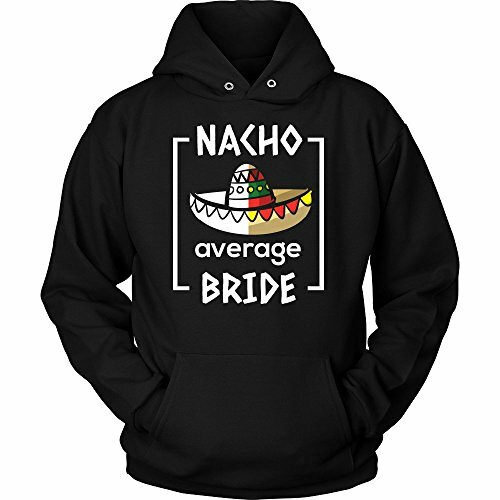 Mexico Wedding, Funny Nacho Average Bride To Be Hoodie by Mexican,Bridal Nacho Hoodie at SCRHI. Hurry! Limited time offer. Offer valid only while supplies last. Our cute and funny Mexican wedding, Mexico nacho average bride to be hoodie is what all brides will love for their coming hen night or wedding party! Cinco De Mayo Or Mexico Bound grab this fun and funny Mexican Drinking Team Bachelorette Party hoodie! A Twist on Traditional Wedding hoodie to celebrate your Bestie's Wedding Plans! Faux Gold Engagement Party, Bachelorette Party, Bridal Shower of Hen Night Shirt. Mexican Themed Bridal Drinking hoodie for Besties, Friends, Bridesmaids and the Maid Of Honor to wear and Matching hoodie for the Bride is also available! There is nothing a better way to flaunt your most adorable status of 'bride to be'. Your friends will be in awe as they see you wearing this super cool and trendy hoodie. Have a wild party with the bride, the maid of honor and all her crazy friends, bridesmaids. Be reckless and fun with our hilarious Nacho hat tee before you become a wife! Guaranteed satisfaction - We will offer a refund if you aren't happy! Don't forget to check out our matching mug designs too! If you have any questions about this product by Mexican,Bridal Nacho Hoodie, contact us by completing and submitting the form below. If you are looking for a specif part number, please include it with your message.